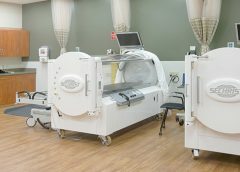 Home > Posts tagged "hyperbaric oxygen therapy"
Why would a patient with a wound spend almost 2 hours a day, 5 days a week, in a locked chamber receiving 100% oxygen? The answer is that medical grade hyperbaric oxygen therapy (HBOT) can be a valuable adjunct therapy for selected types of wounds. Every year, 1.9% of patients with diabetes develop foot ulcers. Of those, 15% to 20% undergo an amputation within 5 years of ulcer onset. During their lifetimes, an estimated 25% of diabetic patients develop a foot ulcer. This article discusses use of hyperbaric oxygen therapy (HBOT) in treating diabetic foot ulcers, presenting several case studies.